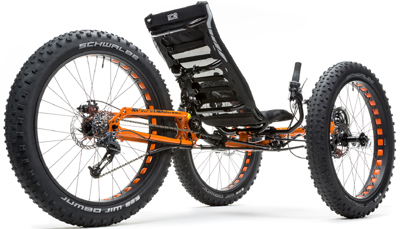 More than any other trike the ICE VTX is built for speed, with an aerodynamic shape, stiff hydroformed frame, and a shell seat. The VTX is built for speed: low, long, narrow in track, optimized for aerodynamics. 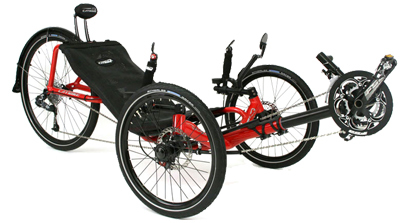 It is several pounds lighter than the Catrike 700, using a carbon fiber shell seat with an innovative system of pads that allow for better airflow under the back and an adjustable recline. The VTX does not fold, but it can be broken down for transport and shipping. Titanium front axles are an option. The hydroformed frame has a chiseled, muscular look, a lot like your legs will after you’ve taken your VTX for a few good runs. Like the 700, this trike isn’t for everyone. The design reflects an uncompromising pursuit of speed which might fit the paradigm of the road racing cyclist who is only a part of Easy Street’s diverse clientele. If speed is what you want, and you want it on 3 wheels, then you should try a VTX. You might like that shell seat more than you think, or not. ICE VTX trikes are built on an optimised ICE frame featuring our No Brake Steer and Rider Positioning System. This varies depending on components. Brakes — Disk brakes only, either the excellent Avid BB7 mechanical disk or the lightweight and powerful Tektro Auriga hydraulic. Crankset & Front Derailer — Triple crankset available for 10-speed, double available for 11-speed. Seat — Air Pro shell seat for speed, available in fiberglass or carbon fiber construction. Parking Brake — A simple Velcro straps or a disk brake on the rear wheel with a special lever. Tyres — British trikes all come with tyres, not tires. A wide selection of skinny tires are available.